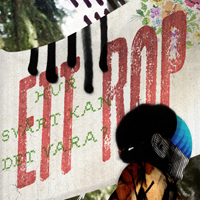 Welcome to the world of ETT ROP PÅ HJÄLP (A CRY FOR HELP) ! The debut album from this band from Gothenburg caught me really fast when listened to their demo they sent us. What caught me was the originality of the band, but also their lyrics. E.R.P.H. are inspired by the 70's hardrock scene, NOVEMBER, SOLID GROUND, but also, the band have a bluesy feeling, and most of their tracks have different grooves and tempos. From hair raising dreamy tracks, to more forwarded smashers. A highly recommended album with outstanding lyrics !